We came to live in China as a family, full of hopes, a few expectations and a real sense of adventure! For the first three months, everything was new and exciting and we had our explorers’ hats on. Fast forward four months and I would start to wake up in the mornings, missing home, missing family and craving all the foods that are hard to get here. Sometimes it doesn’t matter how wonderful your time away is, how great the experience, it is totally natural to feel that deep sense of wanting the old familiar and to be back at home. When I started to feel homesick, I started to make sure I did the following and perhaps, if you ever have those feelings, you could try some too! 1. I LOVE it when I receive post or an email but of course I need to make sure I keep in touch too. I wrote to lots of friends and family telling them how I felt and also my news… and then throughout the week, I kept receiving different messages from each one, all assuring me that life was the same back in the UK and to try and enjoy my time here with my little family – it helped enormously! 2. Ask for post and parcels! I asked my mother to send me some bits and pieces (and was very specific) – and a few weeks later, an enormous parcel arrived for us all filled with joy and treats! I read her letter over and over and we all are continuing to enjoy the benefits of that parcel. Sending post overseas is pricey (her package cost about £70!) but you can always offer to pay the postage price and/or for what you have asked for. I love seeing an email in my school inbox from our wonderful receptionist telling me to pop on over to collect a parcel! It makes my day, enables me to feel connected and sustains a feeling of happiness that transcends getting the material goods… it is the thought that really does count! My brother once sent me a tiny package with a few grains of rice in as a joke… it sure made my day still and I was smiling all week because of his thoughtfulness. 3. Hang out with your new family. We are all in the same boat. Most of the staff in the school have travelled overseas, some with children others not, but being together, eating meals, planning events, traveling in the holidays and going for a coffee after school are all helpful ways to keep the feeling that you are not alone out there – you have friends and they might not be blood relatives, but most of them if not all would do anything for you if you needed it! One of our friends is travelling abroad for the winter break and she has kindly offered to let us use her apartment whilst she is gone so we can cook in her oven (most people don’t have an oven here!) It’s these small acts of kindness that can warm the cockles of the heart. 4. Allow yourself time to feel sad… then get moving! I feel quite lucky that I have my daughter and husband here – they are both amazing! I also try to see our time here through their eyes – my daughter is having the best time and my husband is making the most of not working to serve the school community and our family by washing, cleaning and cooking -priceless service! So I take time every day to look around and to count my blessings and to be grateful for all we have – a really lovely and spacious apartment, friends, good food (albeit not the pie and mash and gravy I am craving but still!) the chance to learn more about this wonderful culture and more time than we ever had in the UK to spend time together as a family. 5. Become involved. Whatever the school is doing, whether it’s Secret Santa, a staff do or an outing… go for it! Loneliness can bring about more loneliness and sometimes you just need to say YES! I WILL go on that trip… I WILL make a dish for the potluck and go to that concert. Reach out to others… let them know how you feel and don’t suffer alone. You are one of a few people who get up from their couch and venture to another part of our small yet vast world – it’s amazing what you have already done and just the act of you travelling to this country has enabled others in your home community to feel inspired. I only know this because every now and then, someone from home reminds me of this!! And that makes it even more worthwhile – some think it’s selfish to travel but I feel it can affect everyone in a really positive way. You create ripples, you bring opportunities and if other people allow themselves, they can be motivated to make changes too. My Dad wrote me a very special message the other day in an email which made me feel SO happy and glad that we took this step to come here. He said that our daughter would one day have an amazing scrap book of memories to look back upon… so if you’re feeling homesick, focus on the positives, try not to dwell too much on your favourite shop at home (that is what I have been doing the past few weeks!) and keep reminding yourself why you travelled in the first place! 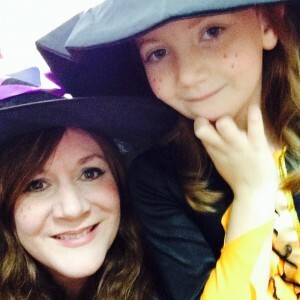 My daughter and I taking part in school Halloween celebrations! My husband and I spent two years in China. We were completely cut off from the states as we couldn’t get any mail where we were and without a vpn had trouble accessing things on the internet. Skype became our only lifeline. Those first few months were a bit tough, but we adapted and found we actually loved being on our own. We explored, learned so much about the culture around us, made some great friends, and kind of created our own little family of the two of us with a couple of good friends. By the time we found a vpn that worked well, we were well settled in and loving our life and independence in China.